I love autumn, my favorite season, really. So do the bees that are abuzz about my fall asters. This frostweed planted itself on a greenbelt fence in a garden we taped last week. The family’s left this section to its own devices. I wasn’t fast enough to catch the bees and butterflies all over it. Nearby, I spotted Abutilon palmeri and American beautyberry beyond where no irrigation sponsors them. I don’t know if someone planted them long ago or birds took on that job. Then, in Weir, we taped a young family’s prairie restoration where Monarch butterflies were all over native liatris. At Oak Hill Elementary, the buzz is about kids who planted this garden for birds, bees, and butterflies. We were totally buzzed to meet Barbara and Bobby Wright from Wright’s Nursery in Briggs, southwest of Killeen. They’re an oasis of native plant and very well adapted plants! Here are just a few to add to your list. Wooly bee bush (Aloysia macrostachya) works in various soils with smaller habitat to 4-5’ to attract bees. Deer resistant. Native tea bush (Melochia tomentosa) was a new one to us. This shrub to about 2’ likes sun in various soils. April to October flowers attract butterflies. Fragrant night blooming Berlandier’s trumpets (Acleisanthes obtusa) flowers April to November in sun to part shade. Technically, it’s a vine, though the Wrights have only seen it to about 2.5 feet spread and height. Really, we are beyond lucky to have dedicated, hard-working people like Barbara and Bobby to spread the good native word! Watch now. And, we thank gardeners, like Amber Simon, for growing native plants like her perennial Texas Star hibiscus, our Viewer Picture of the Week, blooming its head off in a container for now. Now, do you need an evergreen vine that doesn’t take over the world? Consider Daphne’s Plant of the Week, Coral honeysuckle (Lonicera sempervirens) that’s a pal to hummingbirds, butterflies and bees. At The Monument Café in Georgetown, it joins crossvine and grape vine in a vibrant privacy screen. Deer aren’t running around the streets of Georgetown but in deer-hood, they will eat the flowers. On a high trellis or arbor that they can’t reach, the pollinators and hummingbirds can dine without concern. Find out more. As we’re planting new trees, of course we want to mulch them. Doing it the wrong way, like this “volcano” mulch, can end their lives too soon. Daphne explains why large established trees can go without mulch, but illustrates common examples of techniques we should avoid. 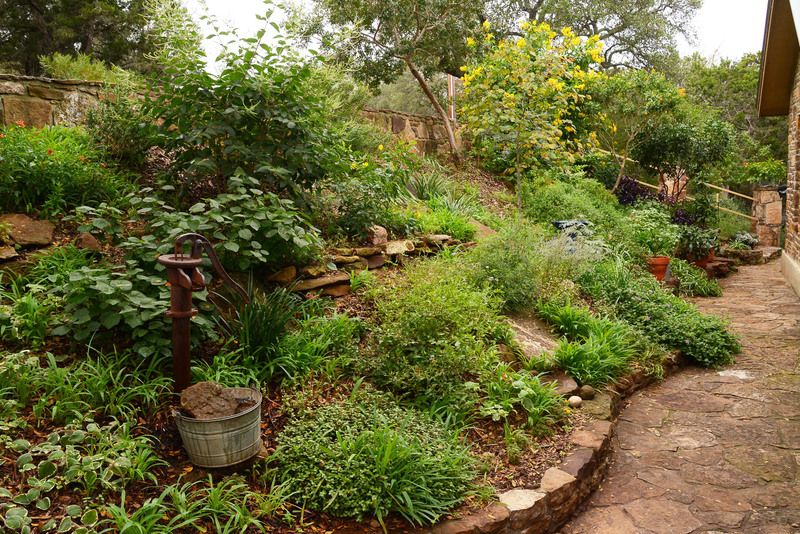 On tour in San Antonio, meet effervescent Ragna and Bob Hersey who changed their garden’s viewpoint from its routine wall-to-wall grass. From no-perspective flatland, she and Bob built layers of dimension. Sadly, her roses succumbed to chilli thrips and she’s replanted with succulents. That’s the best thing about styling a design where we can make the inevitable plant changes. And wouldn’t we all love a charming path like this to wander? Along the way, Ragna tucks in discoveries. The ultimate recycler, Ragna turns discards into enchanting garden art. I LOVE this washing machine tub she snagged to turn into a container. Beloved shells collected by the family over the years inspired this sweet accent near the patio. She didn’t waste any time to claim this thrifty mirror and adorn its new life with shells. Meet Ragna & Bob and see the whole story!